Retirement is good. It gives me the time to do things I have been putting off because I didn’t have the time. That’s the way it is supposed to work–having the extra time for things like reading. I love to read but somehow I got out of the habit of reading the last few years. Other things always seemed to take priority. But this summer I have made it a point to change that and start reading more again. And no, I don’t mean trying to translate and read an old German-American Cookbook like I wrote about last week. So what have I been reading? A practical how-to book for starters. The older I get I wonder who will want my genealogy research collection after I am gone. The collection would include research data, photos, documents, and other artifacts. Keeping all those things organized has always been a challenge for me but I never considered that organization could benefit me as well as the future recipient of my collection. A Karen’s Chatt reader told me about a book she wrote that addresses those points. I downloaded her book to my Kindle and read it this past week. It is not a long book, but a quick read of 98 pages, and it will be handy to pull out for future reference. Planning a Future for Your Family’s Past, Marian Wood, 2016. 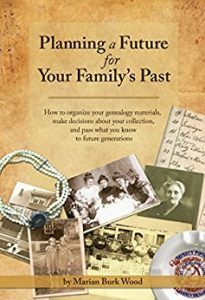 The book, authored by Marian Burk Wood, is Planning a Future for Your Family’s Past: How to organize your genealogy materials, make decisions about your collection, and pass what you know to future generations. It was published in October 2016. I have the Kindle edition but it is also available in paperback by CreateSpace Independent Publishing Platform. Marian is a New York City native and was in marketing before co-authoring a number of college textbooks. She is also an avid family genealogist, genealogy lecturer, and genealogy blogger of Climbing My Family Tree. Marian’s book gives step-by-step suggestions for organizing family genealogy research data, photos, documents, and family heirlooms. Her ideas go beyond basic organization and include sorting, labeling, filing, cataloging, and indexing. All things that are helpful to me. The book addresses the subject that all genealogists will face someday: what will happen to our genealogy collections when we are gone? So her organizational tips are not only helpful to me today they are also aimed at helping the future recipient of my genealogy collection. Marian’s book points out how helpful cataloging and indexing the different family collections would be for the interested person who will some day inherit a collection. Basically, if everything is organized, divided, and labeled it will make it easier for that person to know what has already been researched and collected. The book offers advice about passing on genealogical materials, setting up a genealogy “will,” and even includes some sample forms. In addition her book covers sharing research information and allocating ownership of family photos and heirlooms–what to keep yourself and how to decide what to do with the rest. I plan to put many of the organizational ideas into action. Thanks, Marian, for some very good suggestions. 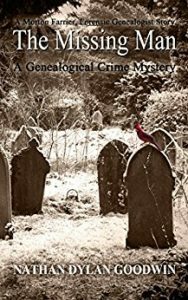 My summer reading has also included a non-fiction genealogy mystery series by Nathan Dylan Goodwin—The Forensic Genealogist series, featuring fictional genealogist Morton Farrier. The Missing Man, Nathan Dylan Goodwin. As far as I know there are currently six books in the series and I am reading the sixth. I like to try to read them in order, although you do not have to follow the specific order. These books are hard for me to put down. Morton Farrier is a forensic genealogist and his client research takes some very interesting twists and turns. 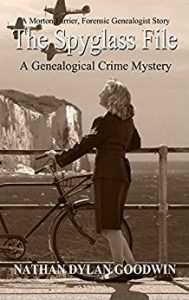 As the genealogical mystery unfolds I like the way the story goes back and forth in time, from the present to the past, allowing the reader to learn what actually happened in the past. In addition, Morton has his own personal genealogy mystery to solve. I hope Goodwin has plans to write a few more books in the Farrier series. The Spyglass File, Nathan Dylan Goodwin. There is at least one other genealogy series by a different author and I have those books loaded on my Kindle, ready to begin reading. Earlier in the summer I enjoyed reading The Women in the Castle by Jessica Shattuck. 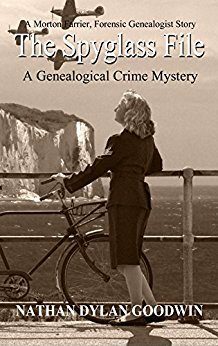 This is not a genealogy mystery but is a historical fiction novel set in Germany during and after WWII. I am so enjoying having the extra time to read! Thank you again for taking the time to review my book, Karen! I hope you’ve found some of these ideas useful. Happy ancestor hunting! I found your ideas very useful. I just need to start implementing them!